Christmas is such an exciting time for children! Not only are they on holiday but they also get the chance to spend extra time with family and loved ones doing things that really matter to them. But it can be overwhelming too and, with that in mind, I’ve put together a few Christmas Hacks that hopefully can make life a bit easier for you. It’s not called the ‘silly’ season for nothing and it’s not unusual to find parents feeling at a loss as to how to tackle certain situations. I think there’s a sense of silliness perhaps due to the beautiful (?) 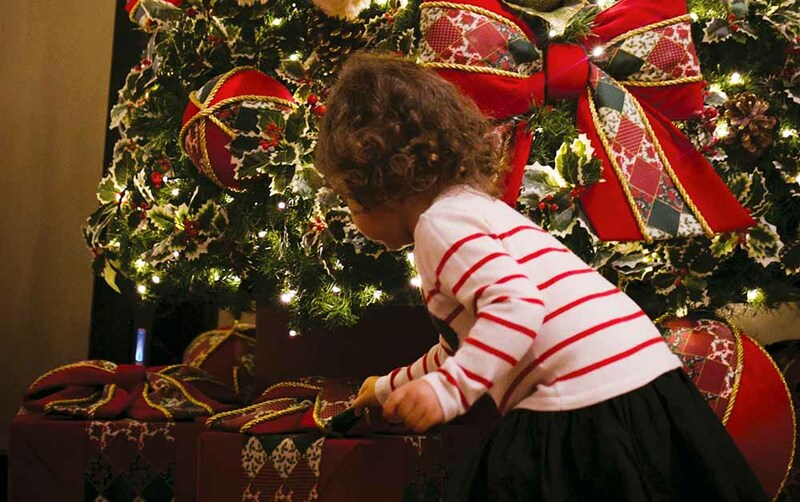 disruption that holidays bring to kids’ daily routines. No longer are they bound by the rules of waking at 7am, going to school, coming home, doing homework, going off to their after school activity, having a shower and dinner, rinse and repeat. In fact, in many homes along the Peninsula, it’s just the opposite. The holidays bring a relaxing of rules and boundaries and, while most kids seem to love it, problems can arise. A simple hack to ensure your children cope with the holidays more effectively is to keep a routine in place. This can be something like the steps you want them take in the morning or before bed. Maybe it might be encouraging them to wake up at the same each morning. It doesn’t still need to be 7am, but maybe you ask them to be up by 8am. Routines also have added benefits for any little ones that might be affected by nervousness or anxiety too. We know that when routines disappear, anxiety tends to increase. Having a simple structure can help your child feel calm because there is predictability in the day. When they are calm and rested, they’ll be able to enjoy their break and return to school ready and eager to learn, play and develop. It’s so good to be able to take time and catch up on Netflix though this needs to be mixed up with physical activity regularly. The children need to be outside and this is the time that they get to really do all the fun things with you! Take them on bike rides on Peninsula Link or go for a hike at Bushrangers’ Bay. Set aside time yourself to make a plan of activities, indoor and out, that you can do with them. Maybe you create two jars. One says ‘indoor fun; the other says ‘outdoor fun’. Why not write out a bunch of activities, cut them up, fold them tightly and place them in the appropriate jar. Let the children take it in turns of picking one activity each day and follow through with it. Release your expectations that the children will and should behave perfectly over the holidays. The steps above, like having a routine and planning indoor and outdoor activities, are great but there’ll still be times when they misbehave. It’s to be expected, especially depending on their age. If you understand this and if you can accept that their behaviour will be less than ideal at times, it just makes it all the easier for you to respond in a less emotional way. We don’t want you being stressed on your break as this is supposed to be your time to unwind and recharge too. By focussing on the bigger picture, you’ll be able to let some little things slide in the interest of having a peaceful break. Buddy up with your partner, your parents, friends or others to create opportunities for yourself to unwind and relax. Tag team with Dad and when you get an afternoon to yourself, use that time to really invest in activities that you find calming, soothing, relaxing or refreshing. Perhaps you head to the Hot Springs, go for a walk on the beach at Capel Sound, have lunch in Mornington, or take your girlfriends out to the drive-in at Dromana. It doesn’t matter what you do; what matters is that you do it. When you look after yourself, you are happier, healthier, calmer and you cope better with drama. It might be an afternoon away from the children and family but it’s something you are doing for them. Make sure both mum and dad get ample opportunities to take breaks and that they encourage and support each other in doing this. Having the children see you both take breaks to look after yourselves is also a really great way to model self-care for them. Children are impressionable and curious and they’ll wonder what you are doing and why. Explain why you are taking the time and relate it to how they have time too. When you return, they’ll be full of questions (perhaps) and that is another opportunity to reinforce the value of self-care by explaining all the benefits of the time away. You might inspire the children to find acts of self-care that they like too. Maybe you help your daughter create her own spa day and you both make bath bombs together in preparation, or grab some face masks and hair treatments? Maybe you ask your son what he likes to do and give him some suggestions and support in creating his own self-care ritual (even if that means he wants some alone time with his cricket bat in the back yard without sisters bothering him!). You get the idea. I hope these Hacks help and I wish you the best, happiest, merriest Christmas ever! Dr. Brooklyn Storme, PhD is the Director and head psychologist at All Psyched Up, a mindfulness-based allied health practice on the Mornington Peninsula. When she’s not at work, she’s usually teaching Gabe new tricks or spiking up his purple Mohawk.